Located in the town of Thônex, near the district of "la Seymaz" and the municipality of Vandoeuvres, we propose on sale this beautiful new houses of architect, traditional construction, standards HPE (High energy performance). They will enjoys a quiet and residential environment, a very good SOUTH exposure, and the proximity to public transport, shops and schools. The villa will be built on a flat plot of approximately 440 m2, fully fenced with plantations. Of a contemporary architecture, they will offers a generous floor space of 308 m2 spread over three levels. They consist on the ground floor of : a beautiful entrance with plenty of storage space, a large living room with fireplace, dining area and access to a beautiful covered terrace facing south. A beautiful open kitchen, and a guest WC complete the level. Upstairs, they offers : a beautiful master bedroom with dressing room, bathroom / shower, three bedrooms and two shower rooms. Their basement finally, has : a beautiful gym with a skylight, a large multipurpose room with natural light, a shower room, a wine cellar, a laundry, and a technical room. Project of three houses, one of which is already sold, and on benefit of a building permit entered in force. Construction ready to start ! Payment method: 20% on booking, the balance on delivery. Located in the heart of the California district in Vésenaz, we propose for sale on plans, this new promotion of contemporary villas HPE construction. They will be located in a private residence, with secure access. Their location is ideal, out of all nuisances, close to shops, schools and only 10 minutes from downtown Geneva. The houses will provide a floor area of ​​approximately 210 m2 spread over three levels, as well as a private garden. On the ground floor, they will offer beautiful bright spaces, with large windows, overlooking the private gardens. They will consist, of an entrance with cloakroom and WC visitor, of a nice kitchen opened on the living room (budget 30'000.-), of a nice room-to-eat, and a nice living room giving access to the SOUTH terrace and the garden. Upstairs, the villas will have a beautiful distribution hall, 2 beautiful bedrooms each with balcony access, a shower room, and a large master bedroom with private bathroom and private balcony overlooking the garden. In the basement, they will offer a spacious multi-purpose room of more than 19 m2, and an independent office both lit by large skylights, a storage cellar, a technical room-laundry, and a shower-room which may optionally be arranged. 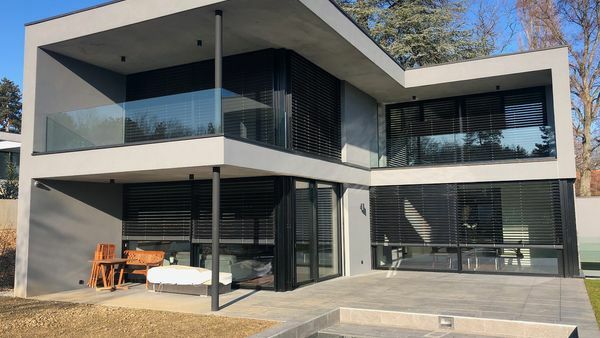 This magnificent contemporary house, currently under construction, is located in one of the most sought-after area of the canton of Geneva, the residential area of ​​Vandoeuvres. It is distinguished by its discreet location, in absolute calm, on a beautiful flat plot facing south with open views of the mountains. The house designed by one of the best architecture firms in Geneva, offers a contemporary design made of clean lines, large windows and beautiful volumes. Its full south exposure, it will ensure a beautiful brightness throughout the day. With a useful surface of about 370 m2, it consists on the ground floor, a beautiful entrance with cloakroom and guest toilet, a beautiful kitchen open to a large dining room, giving access to the terrace, and d a large living room whose large windows also overlook a beautiful south covered terrace. Upstairs, it offers two beautiful rooms overlooking a south facing balcony, two bathrooms, a third bedroom that can be used as an office, and a beautiful Master Bedroom with dressing room and bathroom and private shower. This master bedroom also has large windows and a beautiful South balcony. Its basement meanwhile, offers a large game room and a fitness room both with access through large windows, a pleasant interior patio with direct access to the garden. A shower room also allows you to use one of these rooms as a guest room. Finally, it has a wine cellar, a large laundry room, a boiler room and a technical pool room. The plot of approximately 1000 m2, will be fully fenced, and grass, it will have an electric gate and a double garage. Finally, a beautiful heated pool will complete this beautiful set of standing.